According to early plans, the Clock House should have been the focal point for several office and shop buildings. The 'Clock House' was given its name long before Management for the Wire and Cable Factory had left their mark on the building. Perhaps they had considered a more prestigious name, such as 'Management House', but the beautiful tower with its large clock meant that the building more or less baptized itself. The building, with its long and complicated history was completed in 1920, the year before Ericsson became sole owner of the company which had started to manufacture wire and cable on the industrial estate in 1913. Prior to that, no fewer than three manufacturing companies had succeeded each other over a short period of time on the premises. All got into Financial difficulties and in 1913 the building stood empty for a while before being purchased by SAT (Stockholm's Public Telephone Company). In 1919 the company was restructured, and was given the name The General Industrial Company HT Cedergren with Ericsson as part-owner. A couple of years later Ericsson gained control of the whole company and its activities were coordinated with Ericsson's. To judge by the documentary sources which have been used for this account, the turbulence that we have seen recently on the Stockholm Stock Exchange closely resembles the events which occurred at the beginning of the century. Ericsson had ambitious plans for the Älvsjö area. The company had purchased Långbro farm and planned to build the Main Factory there. They didn't; the recession prevented it and, as we all know, the factory was built later at Midsommarkransen. The Clock House was built as a combined office and factory building. The cost for the whole building, at the time it was erected, with its 391,2 m2 per floor was SEK 368,300. The cellar became a store and lunch room and above this were two floors of offices. The top floor, where the Financial Department sits today, was an assembly shop. Initially, the assembly department manufactured telephone cords for the manual exchanges of the period. After a while, the manufacture of loading coils started. These were the coils that all 'senior' telephony engineers remember they once, long ago, had to calculate the inductance of, when the length of an aerial line, the diameter of the wire and the serewing method were known. 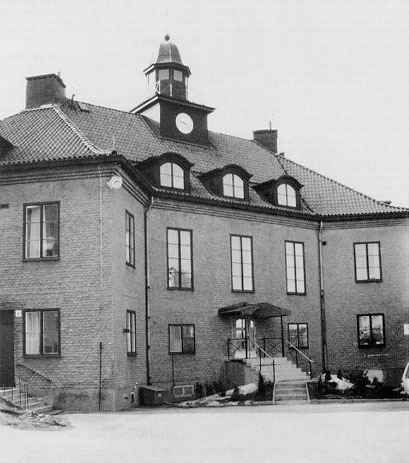 We don't know how the office premises were used originally, but when cable production was coordinated with manufacturing at Sieverts Cable Company, a works manager was appointed for the Älvsjö plant. The director in charge of overall cable production sat in Sundbyberg. The works manager was one of the few white-collar workers in the Clock House to have a room of his own. He chose the room which later on was used by the company physician and now houses the Personnel Manager. The other offices could be called, using modern terminology, open plan offices, for as many staff were placed in each room as the number of desks which some zealous premises officer could squeeze in. As several of the rooms resemble the diagrams drawn by some inventive teacher of geometry finding difficult areas for its pupils to calculate, we can only imagine how the office workers of that time could glance furtively at each other from difficult angles during working hours. Department A, the predecessor to Ericsson Data Services, came to the Clock House in the late 1960s. They occupied the Ist floor, the one with the paintings on the ceiling. This floor was also used for training purposes. The Managing Director's present office was a lecture room. The painted ceilings date from the 1930s. The works manager at that time came from Dalecarlia - his name was Anders Steiner. His childhood friend T. Lundgren was an artist with a special style of Swedish painting, called 'Kurbits Painting' as his speciality. This childhood friend was commissioned to paint the cellings and the result of his toiling with upstretched arms has enticed both Ericsson staff and visitors to lift their sights on entering the Clock House. The lunch room in the cellar soon got the name 'Officer's Mess'. The office staff ate in one room while the foremen and supervisors ate in another. Their room was a little smaller and not quite as grand as the office staff room. When the Officer's Mess could not hold the growing number of white-collar workers, newly-employed staff started to eat in the canteen building, erected later on, where the blue-collar workers also lunched. When a seat became vacant in the Officer's Mess, the white-collar worker with the longest period of employment to his credit moved from the canteen to the Mess. So it is easy to understand that to lunch in the Mess was considered an honour. After a while, rising costs put a stop to the lunch room in the Clock House. The premises were renovated and became a VIP cafe. One can see traces of the Cafe period in what is left of straw-wallpaper and the marks left by a bar. This latter clue tells us that guests at the Clock House didn't only have to make do with coffee and table water. In 1964 when there was an unusually heavy layer of snow on the Clock House roof, some of the roof trusses collapsed and so the attic was discovered. This was found to be full with well-packed documentation dealing with the period when wire and cable were first produced on the estate. These documents, which would have been invaluable to anyone wanting to write the history of the Cable Company, were transported to the boiler room after a cursory inspection. Staff with long memories told stories for many years about that unexpected extra supply of fuel, which meant that no one suffered from the cold in the Clock House that winter. The beautiful tower hasn't only been the home for the clock that gave the building its name; during the second world war the tower was one of the many air raid warning towers around Stockholm. The tower was perfectly suited for its job, since the view is excellent in every direction. The angled shape of the Clock House and the oblique location of the main entrance in relation to the earlier main road may seem surprising when remembering that, when the House was built. Älvsjövägen didn't exist. Outside that part of the Clock House which now runs along the side of Älvsjövägen was a large farm where wheat was grown. So the Clock House only fronted on to Sjättenovembervägen,, and it would have been more natural to have the entrance racing that way. Perhaps the ambitious plans for a major extension of the Cable Company, which came to nothing as late as the 1960s, already existed when the plans for the Clock House were drawn up sometime between 1915 and 1918. If this was the case, it would be a natural explanation why the entrance to the Clock House did not face Sjättenovembervägen. This is a very old road and before Älvsjö village existed, it was called Götavägen and was the old main road down to Götaland (the southern portion of Sweden). The reason why the last part of Götavägen up to Örby Hall was called Sjättenovembervägen (6th of November Road) was that the coffin containing the body of King Gustav II Adolf killed at the battle of Lützen on November 6, 1632 was carried along this route. The coffin was placed in Örby Hall where it rested until a grave could be prepared in the Riddarholm Church. During the 1980s the name of that part of Sjättenovembervägen which runs past the Clock House was changed to Götalandsvägen, a name wmch it will certainly keep, even if some peopie think it should be called Byte Street or Data Drive bearing in mind the present activities in and around the Clock House. At the same time as the need to check the identity of all visitors to the industrial estate grew more urgent, more and more visitors to the Clock House started to come in their own cars. When the building had been planned, no one had thought either about the need for a car park or for any form of entry check. So the main entrance to the Clock House had to be closed. A modest door at the side had to replace the grand entrance. It was not until 1986 that this was replaced with a more reverentially designed new entrance opposite the original one. In the original plans, which can be seen from the illustration, the Clock House would have formed the center of a greatly extended Cable Company with several new buildings. How far these plans were carried out before the Clock House became offices for the Managing Director and administrative staff for the Data Company describe today's reality far better than any attempt to summarize developments. 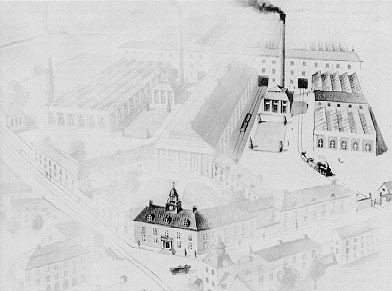 This is how Älvsjö was described in a publication dating from 1 October 1879, about the time the industrial estate, which later became a wire and cable factory, started to take shape. Necessities: Food dearer than in Stockholm. Church and elementary school 10 minutes away. Physician and medical supplies present. Isolation hospital, Stockholm's Municipal Mental Hospital 1 1/2 km. Fittja Inn 8 to 9 km. Several owners of horses and carts present. Railway Station: with through traffic for the Stockholm to Nynäs Railway with ferry connections to Gotland and a considerable traffic to Örby, Långbrodal and Älvsjö residential areas with a total population of some 8000 inhabitants. The Station derives its name from the adjacent Älvsjö Farm. The description above constitutes the content of a printed matter published in 1988. The author is Mr. Harold Björk.